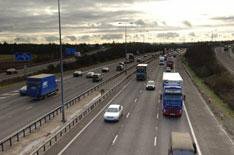 Ban for woman doing 10mph on motorway | What Car? A woman has been banned from driving for seven days after driving along the M32 near Bristol at 10mph. Stephanie Cole, 58, was found straddling the hard shoulder and inside lane of the motorway at 10mph when she was stopped by police. Cole, a multiple sclerosis sufferer, admitted to North Avon Magistrates Court that she drove without reasonable consideration and will have to retake her driving test after serving the ban. The case has sparked calls for a minimum speed limit to be introduced on major roads, but safety campaigners have ruled this out because of fears that drivers would try to keep their speed up when the roads are congested. Cole's sentence has also caused controversy. A spokesman for road safety charity Brake said: 'This case sends out a very strange message to drivers. Mrs Cole was not breaking the speed limit, nor endangering anyone with her actions, but she received a seven-day ban. Yet we commonly see drivers caught at 80 or 90mph get away with a fine or three points.